Is Google in panic mode? I have owned an iPhone since they launched in 2007 and an iPad from day one. I love Apple products, however I found it frustrating that Microsoft’s attitude towards the device was one of a competitor rather than just another platform to deliver software and services to. I had the desire to edit documents on my iOS device and had a look around for a version of Office, as we all know none existed, however Quick Office appeared to deliver quite a good experience on both the iPhone and the iPad, it had slick integration with Dropbox and Google docs as well as the ability to send files to and from my Mac/PC over Wifi. I have used the version of Office that is baked into Windows Phone 7 as well and it IS better, however Quick Office already addressed a large chunk of the mobile / tablet market with some recorded 400 Million users! That is a Massive number and something that Microsoft needs to be aware of when it tries to use the functionality upsell story of their own product. 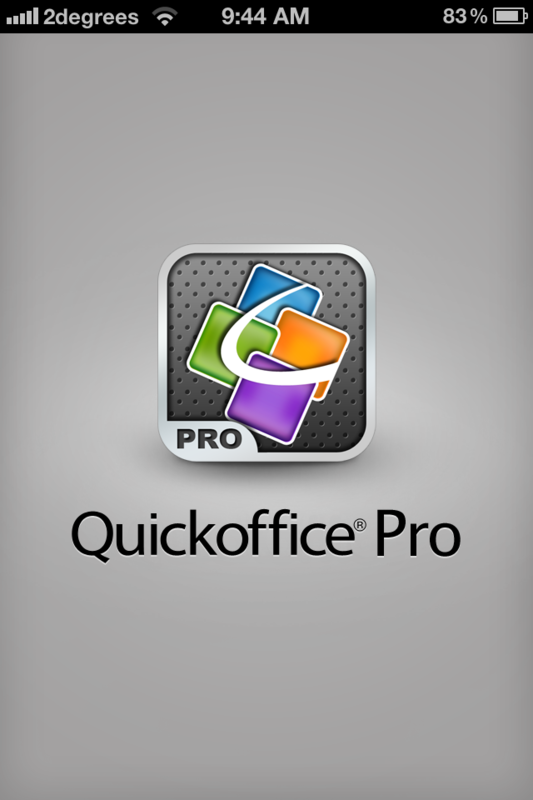 400 Million users have decided Quick Office fills the gap that the lack of Microsoft Office for iOS left. 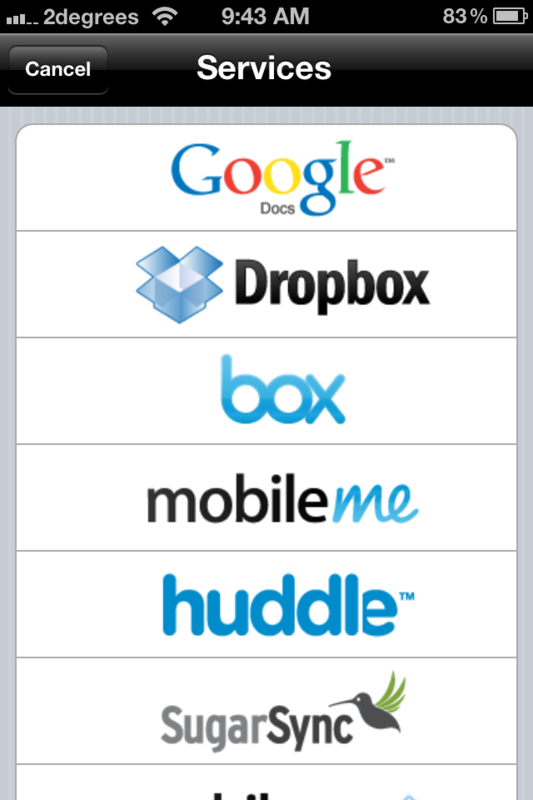 The recent news that Google purchased Quick Office came as no surprise to me. A rich “office” experience on the iOS has been lacking an really Quick Office is the only company in the last 2 years to come close to what Microsoft has already established in the desktop world. I do get the feeling that Google are changing their direction with this purchase, remember Google are the company that until recently were pushing a “browser centric” operating system (Chrome OS). The browser (until now) has formed one of Googles more convincing sales pitches, that is all of your information exists purely in the browser/cloud, there is no need for a client application. I disagreed with this approach, applications accessing cloud services is the best experience in my opinion and it would seem that Google have started to recognize this as well with the purchase of Quick Office. Expect things to get interesting when Microsoft launch their version of Office for iOS later this year (rumored to be November 10th 2012). Microsoft are the current kings of collaboration, offering a richer integration that what Quick Office offered, however the “good enough” approach may see some users stick with Quick Office and wait for the improvements that arise out of the Google partnership. Taxonomy is a word that is used quite frequently when describing the classification and management of information within Sharepoint. Sharepoint is the information management component of Office 365, and as great as it is there can be some hurdles to getting users to adopt it. In a perfect world Sharepoint would replace the file share and any other document based processes within your business. Chris Riley blogged recently on Taxonomy and how important it is to any Sharepoint deployment, cloud or on premise. Taxonomy Planning in SharePoint 2010 – End User – NothingButSharePoint.com. The biggest limitation with Sharepoint is that there are NO limitations… Time and time again Sharepoint deployments fail due to lack of planning. You can plan your Sharepoint deployment so that your users aren’t put off. Keeping it simple and easy to understand while at the same time enforcing a level of governance to ensure the data stored is searchable and relevant. Going from a file share to Sharepoint takes some getting used to and with a good amount a planning it should make logical sense to the user from the get-go. One of the tools we have found to be useful that allow users to work from a familiar environment is Harmon.ie . This tool is a plug in for Outlook and is accessible from the main Outlook pane or any new calendar or mail item. It allows a user to interact with their Sharepoint sites and document libraries right from within Outlook, no need to change to a different app or grapple with the browser experience. Navigation is handled similar to traditional folder structures and its that familiar navigation that adds to its ease of use. Harmon.ie is free up to 250 seats however there is an “Enterprise” version available for USD$129/user/year. There is also an iPad and iPhone client available for free, this client allows navigation of your Sharepoint sites and at a glance view the documents and their meta data. With the current lack of Office for iOS the premium version of the iOS client will take a user to the Web App interface for quick editing of documents. My iPad uses a version of Quick Office (a 3rd party Office style editor) and Harmon.ie recognizes this and allows you to edit documents in this app seamlessly. The important thing from an administrative point of view is to architect the structure of the information within Sharepoint ahead of time. The moment users are able to access the site they will revert to old habits if strict governance isn’t present. Office 365 has to be the cheapest content management solution on the market and with some good planning it can be the best experience for an end-user as well. I may have a better appreciation of the things I can do within my Office 365 environment due to my past life as an IT administrator, but I thought it would be good to point a few of those features out and describe why they may mean something to the average business user. The application that is most attractive out of the Office 365 suite has to be Exchange Online. This hosted email service is available as a base component of all of the suites on offer and is probably the “first cab off the rank” when a customer looks to a cloud offering. Exchange Online launched in New Zealand back in April 2009 and it formed part of what was then known as BPOS or Business Productivity Online Suite. This product was based on a multi-tenanted version of Exchange 2007. In the middle of last year Office 365 launched and with it came a better Exchange Online experience, offering some of the great features you would get with an on premise installation of Exchange 2010. As with any hosted offering the products get better over time and since the release of Office 365 certain features have been added to the suite. These features are make it easier for non-technical employees to administer the functionality of what would be normally complex back-end systems all via a web portal. One of the biggest advances in email technology over the past few years has been the introduction of Mobile access. Microsoft set the standard in my opinion with ActiveSync, blowing away the previous market leader RIM (aka Blackberry). With the RIM offering you needed middleware to connect and manage the mobile handsets, furthermore they needed to be Blackberry handsets. ActiveSync on the other hand is now licensed by Microsoft to many handset providers including Apple’s iPhone and iPad, Google Android devices and obviously Windows Phone 7 devices. ActiveSync allows the management of devices from the Outlook Web App experience, remote wipe etc as well as push notification and contact/calendar/contact sync. As an administrator you are also able to restrict access to mailboxes by mobile devices as well. Legal hold is something that I believe should be part of any email solution. In the press you hear often how emails can get people, and more importantly businesses into and sometimes out of trouble. The legal hold functionality of Exchange Online is provided by the premium product in either the Exchange Online Plan 2 stand alone product or the E3 and E4 suites. Do not confuse legal hold with the personal archive capability. 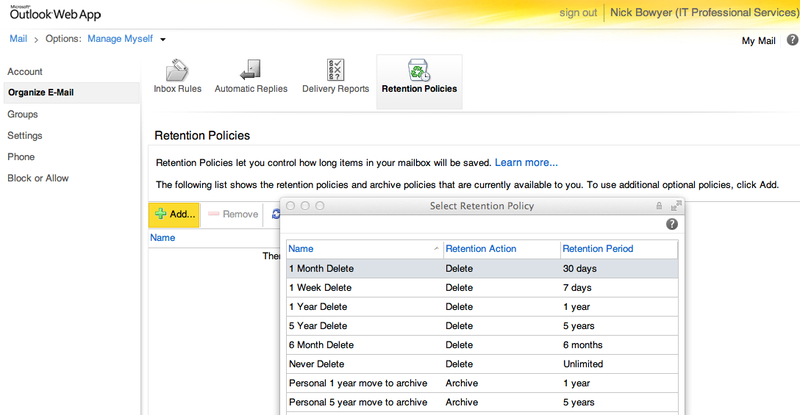 Personal Archive – Provides the ability for users to manage the retention of mail in their mailboxes. Personal archive is available to all suites and product versions of Exchange Online with the exemption of the Kiosk Plans. (Kiosk Plans are able to add the archive product separately). For P1 plans of Exchange Online the Archive and Mailbox capacity is a combined total of 25Gb, Plan 2 is unlimited. Legal Hold – Provides legal hold capabilities to preserve users’ deleted and edited mailbox items (including email messages, appointments, and tasks) from both their primary mailboxes and personal archives. Administrators can use the Exchange Control Panel or Remote Power Shell to set legal holds on individual mailboxes or across an organization. The administrator can then choose to notify the user of the legal hold or not. Deleted Item Retention – Provides the end-user with the ability to recover a deleted item from any folder for up to 14 days. This timeframe can be changed using remote Power Shell commands or via a Service request. Exchange Online is protected by The Microsoft Forefront Service for anti-spam and malware. This product can be tuned via the Exchange Management portal which is accessible to administrators through the Admin Portal. Most businesses I have dealt with have paid an additional cost to filter un-wanted email from their inboxes using a product hosted by a third-party (ISP or other hosted provider) or in some instances another product sitting on a separate server. This feature comes with all product versions of Exchange Online and in my experience hasn’t failed me yet. The administrator is able to configure the Forefront product to alert users if any spam has been filtered by way of email or indeed turn the feature off altogether and let the spam be dealt with by the Junk Mail folder within Outlook. Exchange Online uses a Role-Based Access Control (RBAC) model that allows organizations to finely control what users and administrators can do in the service. Using RBAC, administrators can delegate tasks to employees in the IT department as well as to non-IT employees. For example, if a compliance officer is responsible for mailbox search requests, the administrator can delegate this administrative feature to the officer. It is important to note that many of the features above need to be restricted to certain people within your organization. These are but a few enterprise features delivered by Exchange Online that expands the value email has to a business. Anywhere access, reliability and security are components of what a robust email solution needs to provide. The pricing for Office 365 Exchange Online products are below (New Zealand $). Exchange Online Plan 2 – Unlimited mailbox for users connecting via Outlook and Mobile devices, includes personal archive and legal hold ability – NZD $12.25 per user per month. In one of my earlier posts I talked about a company called WIX who offered a cloud website service allowing users to create beautiful animated websites. One of the small issues I had with the experience was that it limited you to publishing the site using Flash. I was first alerted to the potential for this to change two weeks ago when I saw the Flash logo hovering above the site I had created, it was possible Flash was to become an option. And indeed it did, you now have an option to create your website in HTML5. This comes as welcome news to those of us who understand the difficulty in getting good search engine results (SEO) using Flash based websites. The introduction of HTML5 to the WIX websites follows what the industry has been asking for, HTML5 is now a multi platform language that supports the ubiquitous iOS operating system used on iPads and iPhones. Previously WIX had offered a “work around” for the iOS devices by providing a separate m.yourdomain.com website however this didn’t share the content from your main site and was very limited in functionality. Now with the new iPad having better resolution than your average HDTV it makes sense to offer the same content on both platforms. As you can see along with the addition of HTML5, there is an option for users to create their Facebook page layout using the WIX tools and templates. There is still the option to create the legacy “low fi” mobile site as well. This is a great example of what you get when choosing a cloud offering, a feature addition without additional cost. There are a couple of things I should point out however, you can’t migrate your existing Flash site to HTML5 (kind of makes sense really) and the HTML5 editor still has a “beta” moniker… that won’t bother me as I always make good use of that “save” button!